I stood by my table of books at Chapters in Peterborough earlier this month for a book signing, just inside the front door. Several people stopped by the table to talk about memoirs. Suddenly a familiar face with a dazzling smile appeared. Joanne Culley www.joanneculley.com who took my course on memoir writing four years ago, had also just published her book, Love in the Air: Second World War Letters. We had talked about trading books via email, but I didn’t know whether or not she would be able to get free that afternoon. Lo and behold, there she was! 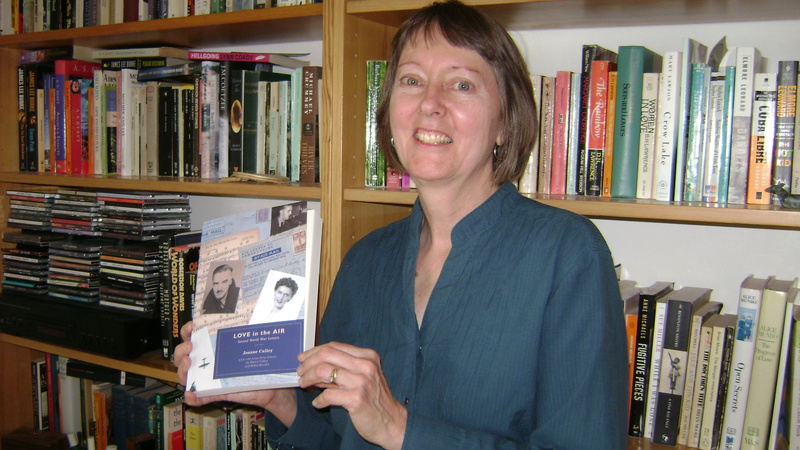 I could hardly wait to have a quick look to see how she had made a story of the over 600 letters her parents wrote during the Second World War. Letters she had talked about during the course. I spent the weekend reading her book. 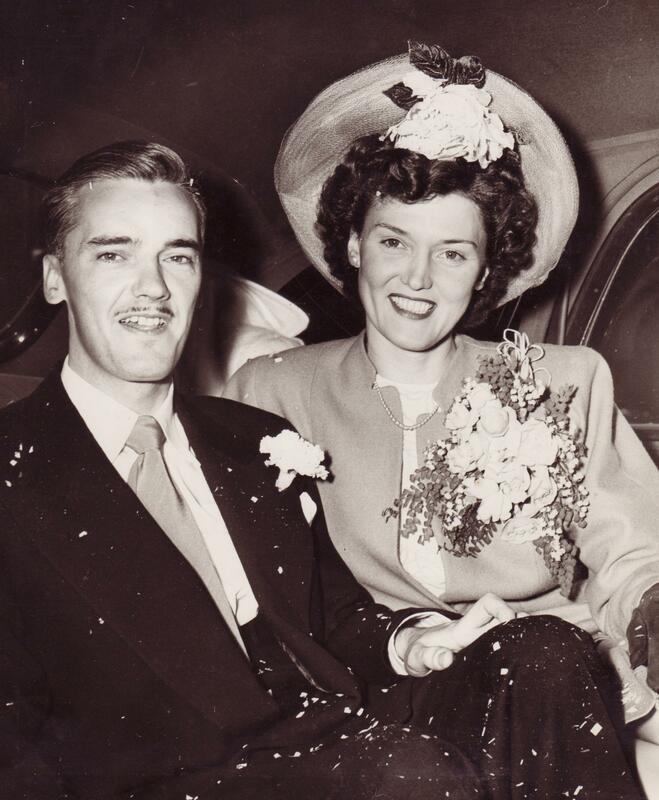 It’s a love story, a history lesson, and a daughter’s tribute to the parents who raised her. The book is strong, and you realize while reading it the enormous amount of historical research Joanne did. It’s a story well worth reading. One thing I really love about this memoir is that each chapter begins with a few lines of a song that was popular during the war. For example, chapter eleven begins with lines from But Not for Me by Ira and George Gershwin. Love in the Air: Second World War Letters is available in hardcover, soft cover and e-book formats from friesenpress.com and online book stores. It was released on May 8, the 70th anniversary of Victory in Europe Day (VE Day). The book includes letter excerpts, historical background, dramatized scenes, and photos. Inside were 600 letters from each to the other while my father was serving overseas as a musician in the Royal Canadian Air Force Band. 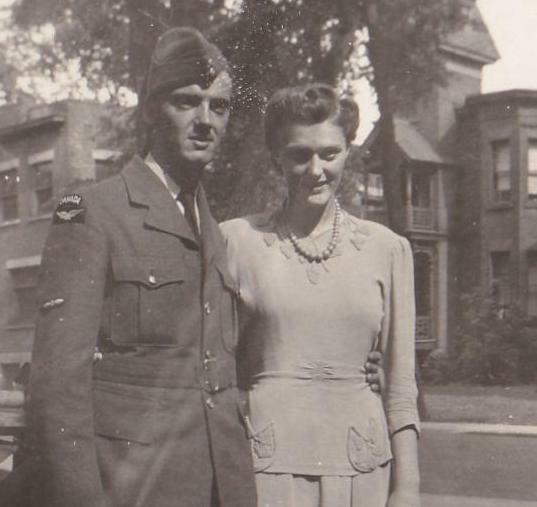 During the war, my mother, Helen Reeder, worked in the Department of Munitions and Supply in Ottawa, and later at the Toronto Transportation Commission, as it was then known. As I read through the letters, I discovered not just declarations of love, but also detailed descriptions of what was happening on both sides of the Atlantic. Harry Culley endured bombings in London, the overall scarcity of food, and the exhaustion of travelling by trains, buses and army trucks with irregular schedules to perform in concerts, parades and dances. But he and the other band members knew that their music was keeping up the morale of soldiers and civilians alike. Of their letters, Helen wrote, “We’ll bind them up and read them over about twenty years from now.” I don’t think they ever did sit down together to re-read those letters – they were too busy living the lives they had dreamed about all those years before. Are there any letters or other artifacts from your family that you can use as a starting point to write your story of the past? I’m one of the “Sevenish” in Peterborough, and we couldn’t be more proud of the successful launch of Joanne’s book. It – and our continued meetings over four years – are a tribute to the impact of your too-short workshop Diane. And congratulations on getting a lot of that down in your new book. Thanks, Mary. I’m so impressed with Joanne and her book – testimony to perseverance and the support of your great writing group. Way to go, all of you! Oh, boy! I’ve read the first few pages and this looks like a well-written, heartwarming read. Yes, Aggie, it surely is. And I’m wondering if you will write a memoir about your permaculture project. I’m thinking ‘of course’! Haha, you are wily. You have the thought brewing in my noggin. In time. A great idea, Diane. What a life she and Lou have lived, just these past few years alone! A lovely and informative post, Diane. My congrats and best wishes to the author. Thanks, Cynthia. The whole book tells us a lot about how love can endure. Wonderful story! Joanne you are an inspiration to all of us to get these stories written, transcribed, told while we can! Marnie, so true. Joanne is a wonderful role model for staying with a writing project, keeping it alive by adding to it regularly. Feeding it with new pages. Eventually it grows up and flies away into the world!